In the coming weeks Drive Electric Northern Colorado (DENC) will be hosting many Ride-and-Drive events throughout Fort Collins and Loveland. These events provide an opportunity for individuals to get behind the wheel of an electric vehicle (EV) for the first time. We are pleased to be able to offer the experience of test driving these exciting new vehicles, which have received very high consumer satisfaction marks and numerous accolades since they first became available on the market a little more than three years ago. Models including the Chevy Volt, Nissan LEAF, and Tesla Model S have received top awards from “MotorTrend,” “Automobile Magazine,” “Car and Driver,” “Consumer Reports,” and others. “Consumer Reports” awarded the Tesla Model S the highest score any automobile ever received in its ratings. DENC has partnered with car dealerships in the area to bring a variety of electric vehicles (EVs) to these events including the BMWi3, the Nissan LEAF, the Chevy Volt, and the Tesla Model S. Our partnerships with these dealerships are grounded in a passion for our community and a desire to provide an informative and comfortable test drive to our friends and neighbors in Northern Colorado. To learn more about some of the dealerships that work with us on Ride-and-Drive events, click here and here and stay tuned to the DENC blog for upcoming blogs featuring our dealership partners. Our next Ride-and-Drive event will be March 22nd at the Promenade Shops at Centerra. DENC is tremendously excited to be working with the Promenade Shops to allow its visitors and customers to test drive an EV. Promenade is known for its “family focused” events, and is looking forward to providing the whole family an opportunity to learn about new vehicle technology and the future of transportation. When you join us, make sure to bring your questions about EVs and DENC. 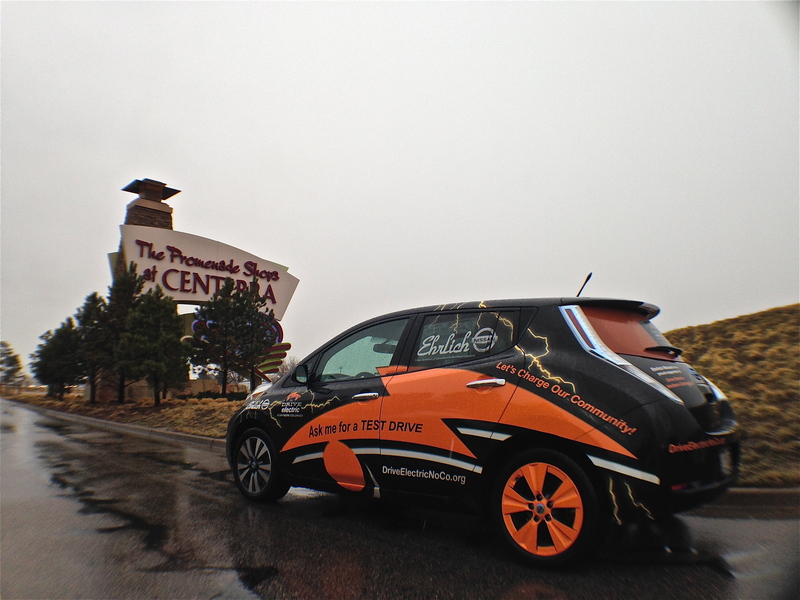 Our group of Northern Colorado EV owners and enthusiasts will be on hand to take a test drive with you. They will be your co-pilot on your drive to explain the functionality of each vehicle and discuss their own personal experiences owning and driving an EV. Come join us between 1:00pm and 3:00pm on March 22, 2014 to test drive any (or all!) of the EV models our partners are bringing out for this event. We are also looking forward to additional Ride-and-Drive events throughout the month of April, which we will be holding in partnership with other action-oriented companies and organizations in the area like Whole Foods, the city of Loveland Water and Power, and the Kites in the Park Festival. Stay tuned to our Events page for more information.